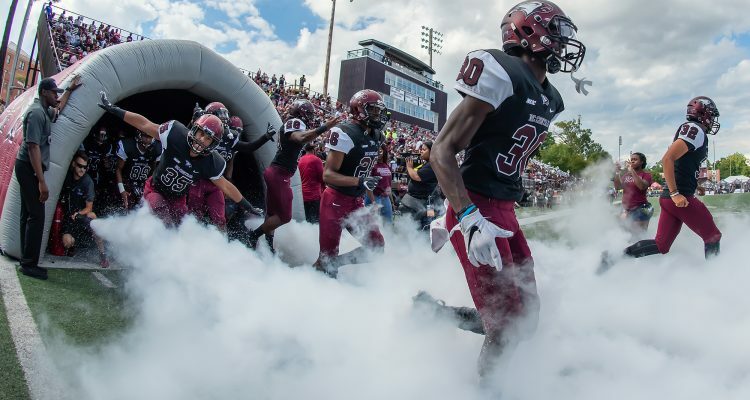 DURHAM, N.C. – A new era of North Carolina Central University football, under the direction of first-year head football coach Trei Oliver, features a 12-game schedule with five home contests for the 2019 season. NCCU kicks off the campaign with three straight non-conference road games, starting with the first gridiron meeting against Austin Peay of the Ohio Valley Conference (FCS) on Aug. 31 in Clarksville, Tennessee. The Eagles make their first of two trips to Maryland to play Towson of the Colonial Athletic Association (FCS) on Sept. 7. The Tigers won both prior match-ups in 2013 and 2014. Towson ended the 2018 season ranked No. 20 in the STATS FCS Top-25 poll with a 7-5 overall record. In week three, NCCU travels to the western part of its home state for a Sept. 14 clash with Gardner-Webb of the Big South Conference (FCS) in Boiling Springs. The Eagles won the 2017 meeting in Durham to take a 3-2 series lead. NCCU was victorious in both prior contests at Gardner-Webb in 1998 and 1996. On Sept. 21, NCCU plays its first home game of the season inside O’Kelly-Riddick Stadium against Elizabeth City State of the Central Intercollegiate Athletic Association (Division II). This will be the 29th meeting in the series, with the Eagles holding a 20-8 overall advantage. 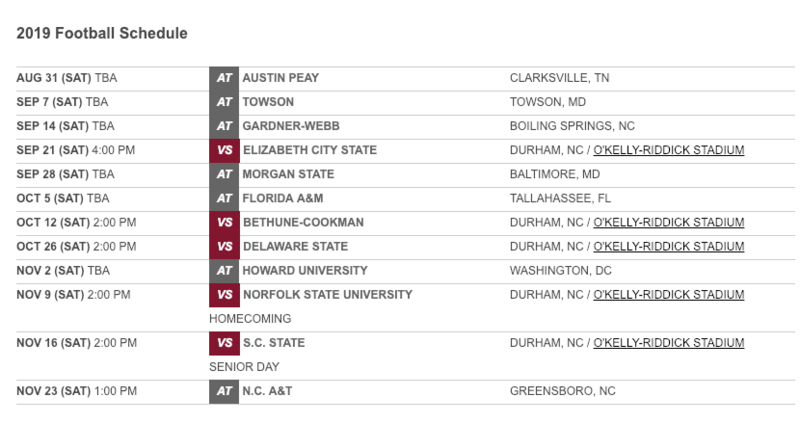 NCCU has won nine of the last 11 match-ups, including four straight. NCCU opens Mid-Eastern Athletic Conference competition on Sept. 28 at Morgan State. The Eagles and Bears have not met on the gridiron since 2016 when NCCU captured a dramatic 21-17 road victory in Baltimore. Morgan State leads the series 24-15-2, but the Eagles have won two in-a-row. October begins with a trip to the Sunshine State to challenge Florida A&M on Oct. 5. The Rattlers snapped a three-game losing skid to the Eagles with a convincing win in Durham last year, increasing FAMU’s series advantage to 7-4-1. NCCU returns home on Oct. 12 to confront Bethune-Cookman. The Eagles have experienced heart-breaking setbacks against the Wildcats in each of the last two meetings, including an overtime loss a year ago. B-CU leads the series 8-2. After a week off, the Eagles host Delaware State on Oct. 26. NCCU owns an 18-7 series lead over the Hornets, but DSU ended a five-game drought versus the Eagles last season. NCCU visits the nation’s capital on Nov. 2 to face Howard. Thanks to a come-from-behind victory in 2018, the Eagles have won seven straight contests against the Bison to take a 12-9-1 advantage in the series. NCCU celebrates homecoming on Nov. 9 versus Norfolk State. The Eagles have won six of the last seven meetings with the Spartans, including last season’s road victory, for a 10-6 series lead. NCCU also boasts a record of 64-19-2 (.765 winning percentage) on homecoming since 1931. Seniors playing in their final home game will be saluted on Nov. 16, when the Eagles host South Carolina State. NCCU closed out last season with a road win over the Bulldogs to even the series at 12-12. The regular season comes to a close on Nov. 23 in Greensboro against North Carolina A&T. After the Eagles defeated the Aggies for three consecutive years, A&T has triumphed in the last two meetings. NCCU will holds its spring football game on April 13 inside O’Kelly-Riddick Stadium.